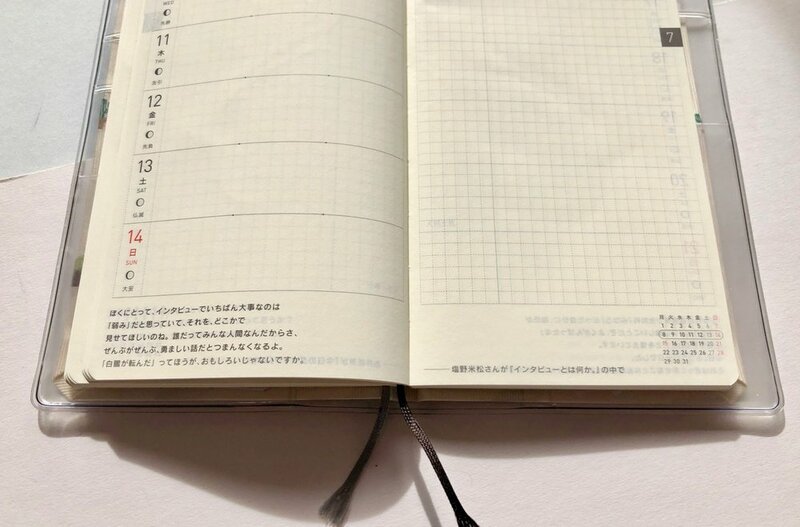 In the online stationery community there is a lot of information and reviews about the Midori Travelers Notebook (MTN). A couple of years ago I dipped my toe in the water and tried the Passport MTN, but this didn't work out for me. However a couple of months ago I became intrigued with the MTN again and started reading reviews online and looking at stacks of YouTube videos. And then right on cue The Journal Shop sent a money off voucher via email so I snapped up the regular MTN in brown. Brown MTN, 012 Sketch book, 001 Lined notebook, 020 Kraft File and 021 Binding Bands. This set-up lasted about 6 weeks. I used the lined notebook all the time. I found an interesting use from Stuff & Things on YouTube about making notes on the ink colours being used. One half of my notebook has been used for this, whilst the other half has been used for general note taking. The Sketch book and Kraft File weren't getting used a lot. I included in the Sketch book in an effort to encourage myself to doodle and sketch. This didn't work out as planned so this notebook along with the Kraft File was removed from MTN. They took up valuable space so I decided to ditch the extra baggage. The contents of my current MTN includes the 008 Zipper Case, 001 Lined Notebook, 017 Free Monthly Refill, 019 Free Weekly Refill, 021 Binding Bands and Travelers Notebook Pen Holder Medium. This is a completely different set-up to my first attempt. The Zipper Case is the first item in the MTN and a valuable addition. I don't have too many things in here, just small items that I either like the look of or want to carry with me. I have a couple of photos, some stickers, a Field Notes Hello card, an Open University course card, a small Kraft pocket envelope, a few Midori bicycle paper clips and a dollar bill from my recent trip to America. These are mostly personalised momentos but there are some useful stationery items as well. The lined notebook is still being used for general note taking, reminders and to-do lists. This is the first notebook is the TN allowing for quick and easy access. This notebook is all about grabbing notes on the go and capturing whatever I need to. My second notebook is the free weekly refill notebook. This is called a free weekly refill as it has the traditional weekly calendar set up but allows you to add in the month and date information. The beauty of this refill is that you can start it at any point during the year. For instance I started on the 19th October after I bought this refill from JP Books in London. This was bought solely due to Eunice from The Daily Roe. Her weekly pages are stunning and where I am unable to draw, I can perhaps learn to journal slightly differently. 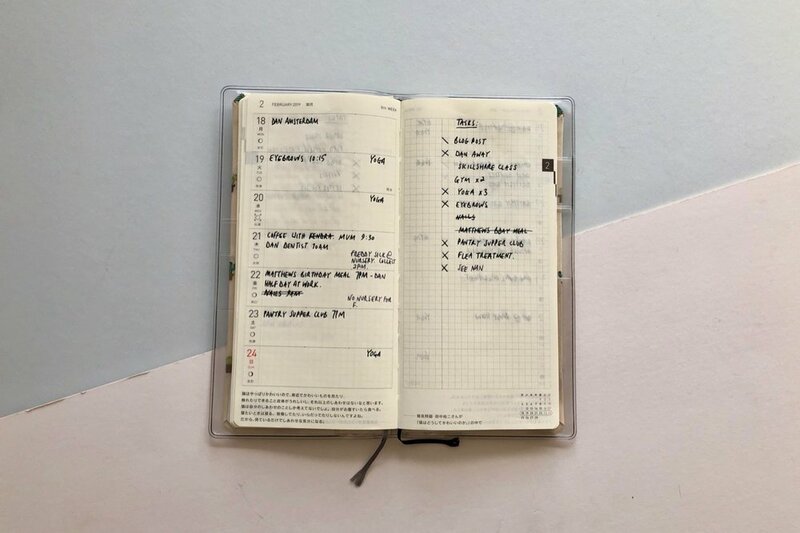 I use this weekly planner to capture small nuggets of information from my day. 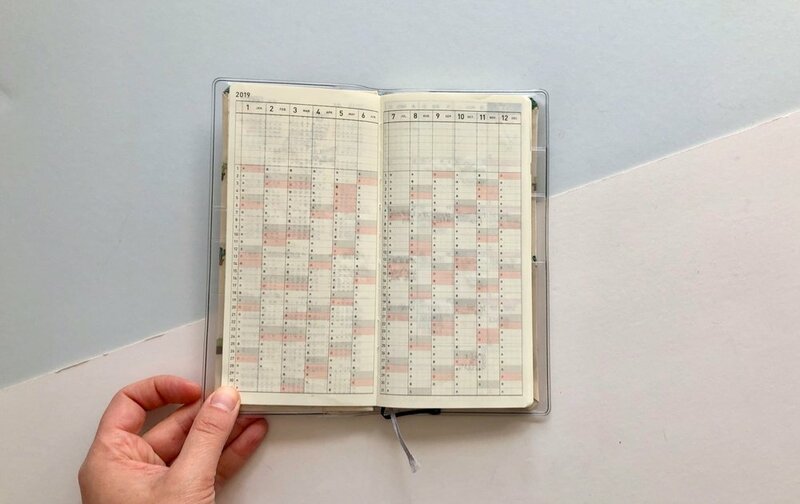 On the left hand page you have the week days and on the right you have a spare blank page to include any notes, useful information or ephemera which may remind me of what I have been doing that week. I like the idea of this format of journaling and think that later on it will be really nice to flick through. If I can create some fun and exciting pages and remain motivated to continue with this journal then this should work pretty well. The last notebook is the free monthly refill. Again this is the same process as the free weekly notebook. You get the grids and outlines there on the page but with no months added in. That means again you can add into this whenever you want. 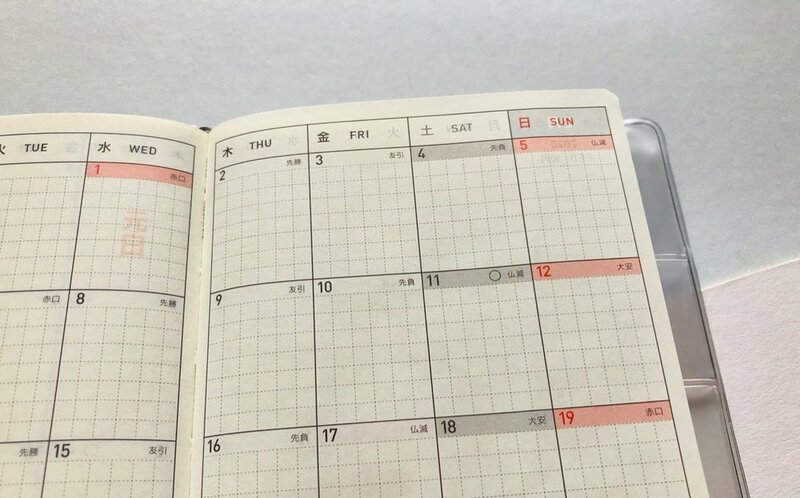 This notebook is used for pure planning. Not recording of events or making notes of my days, this will be a forward looking planner. In this notebook I will co-ordinate my blogging activities, from planning, photography and posting as well as my study schedule. I like the month view, I can figure out where I can fit things in whilst giving me the ability to look at the month as a whole. This will probably be the most important insert in my MTN as it will be where I co-ordinate everything. The MTN system is not for everyone and I really took some convincing on its merits. But I am totally bought into it now. So much so that I bought the Blue Edition MTN after visiting JP Books as they had it for such a bargain price, I just couldn't resist. Brad once described the MTN on the Pen Addict podcast as the fountain pen of the paper world. This always stuck in my head and I think it's completely true. Not only do you get a gorgeous leather case but you can modify the inside exactly to your liking. Simple or packed full of crafty goodness the choice is totally yours. What's more you can pull this to pieces as many times as you like and change up how you use it. It's an evolving system. I will aim to include some progress posts on my set-up of the MTN as time goes on and perhaps share some of my weekly journal pages, if they are viewable. There really are loads of online resources from devout MTN users that you can very easily spend hours upon hours watching and reading all about this system. There are however a few that I have found particularly helpful. Baum-Kitchen Stories - these are really incredible insights into how people use the MTN. A particular favourite post of mine shows how the owner of Baum Kitchen repaired their six year old MTN. This shows the longevity of these notebooks and the way in which they age with use. It's totally gorgeous. The Daily Roe - Eunice from The Daily Roe creates gorgeous MTN pages. She is the person who has inspired me to try my hand at keeping a simple weekly journal with the 017 free monthly insert. The pages she shares through her blog and Instagram account always have me gazing at them for a while marvelling at the things she creates. Seaweed Kisses - there are some great YouTube videos on the Seaweed Kisses channel. From setting up the MTN to its merits and uses I have spent a lot of time watching these videos. They are a great source of inspiration. Patrick Ng - Patrick is surely the starting point for a lot of MTN adopters. Patricks Instagram and Flickr accounts show all sorts of MTN information and goodness. Patricks website is also a font of knowledge, although this has not been updated for some time with fresh content. 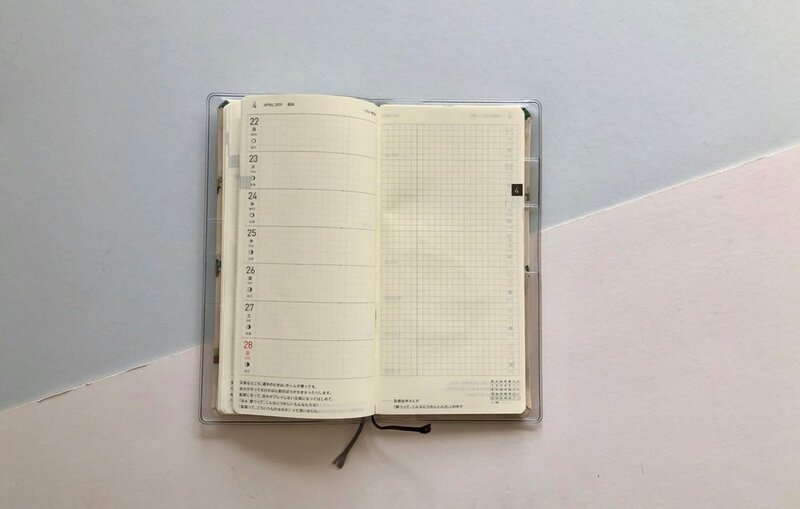 Midori Facebook Group - there are a few options out there but the one I follow in particular is the Midori Travelers Notebook Resources Group where people tend to post all sorts of photos, links and sale items. This is a great source of inspiration with lots of people sharing how they use their MTN. There is also a lot of Fauxdori information included within this group, so it's not pure MTN.